This was a huge hit at our last Red Hattering! 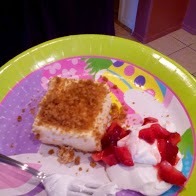 Mix graham cracker crumbs, sugar, melted butter or margarine until well blended. Press mixture into 8 x 8 pan. Line bottom of pan with crushed Graham crackers. Pour in filling and top with more crushed Graham crackers. Chill at least 4 hours and serve with fresh fruit and whipped cream.